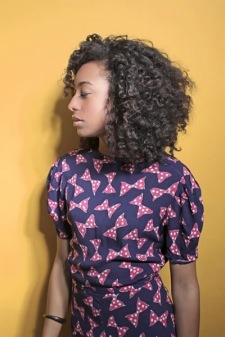 Last week found 31-year-old UK soulstress Corinne Bailey Rae belting out songs from her critically acclaimed album The Sea at London’s Royal Festival Hall. Now she’s preparing to jet over to this side of the pond for a show at Avalon in Hollywood this Thursday (October 28). Idolator is giving away two tickets for the gig (click here to enter—but hurry, since the contest ends tonight). One need only check out Corinne’s stunning session for Nic Harcourt’s Live Buzz to realize she turns out one killer show. And ahead of her L.A. gig, she sat down to talk to us about her forthcoming release The Love EP—which contains covers of Prince, Paul McCartney, Bob Marley and Belly songs—and how she found comfort by recording her Top 10 album The Sea after the loss of her husband.IDOLATOR: Your album The Sea came out earlier this year after a really tough period in your personal life. Did writing those songs help you to heal in a way? 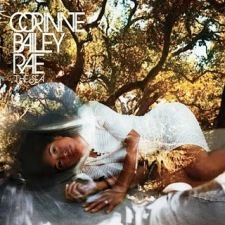 CORINNE BAILEY RAE: I just feel that music is a really important way of expressing yourself. As a teenager, music was a way that I was able to find an identity and I was able to work out sort of exactly who I was. My mom is from England and my dad is from St. Kitts in the Caribbean. By that time I had short hair and a leather jacket and I really liked girl bands. I played electric guitar but I also loved soul music. But all those things were alright. It was okay to have what you would think is differing things existing in the same person. In this period I found myself writing songs and singing out about the way that I have been feeling. I think that music has been really useful [for me]. It’s important when people have trauma and massive change to just actually voice the things that are going on in the mind—even if it doesn’t make sense. Since you mentioned it, I’m curious—what girl bands were you listening to as a teenager? CBR: I loved Veruca Salt and I loved Belly and I loved Hole—the bands where the music was really simple but really chaotic as well. It was such a contrast from the pop music that was everywhere in the ’80s [that was] just highly manufactured and arranged and densely produced and technically written by some brilliant musician. Suddenly it’s just like three people—one playing the drums, one playing the bass, one playing guitar—and it was just like, wow, this is music that we could make, too. Veruca Salt’s American Thighs—still a great album. CBR: I love that album! It’s amazing. You’ve covered Bob Marley’s “Is This Love,” which is your new single. Why did you choose that song in particular? CBR: I love Bob Marley, and unless you have a lifelong experience with reggae, I think that you can’t really play reggae. It’s a real specific feel. I thought a lot about that late, dirty 6/8 [time] thing. I really like that D’Angelo record Voodoo and how everything feels so late on there. So I just thought about that song “Is This Love” and how poignant it sounds and how it feels when it’s stretched out at that tempo. When it’s the start of a relationship and it’s this questioning—”Is this love?” “Is this it?” Is this what it feels like?”—it’s just so tentative. And I love the descriptions in the song, and I think it’s amazing, the idea of two people against the world in poverty and the idea that love is everything that you need. We’re having a ticket giveaway your show this Thursday (October 28) at the Avalon in Hollywood. How did that gig come about? CBR: I thought it was a venue that has a lot of character, and I thought I’d really love to play over there. L.A. and New York have become second homes for us as a band. The response that we get from those two places is so different from anywhere else in the world—it’s so enthusiastic and people are shouting out things. There is so much more of the culture of call-and-response, which I guess is an African-American thing but it’s become a wider part of American society. I really feel with this record that it’s a live-feeling album, it’s an honest record. To me, I’ve really just loved turning up and playing it to people and having people that maybe never heard it or heard of me—who got taken to a concert by a friend or a partner or somebody they work with—just putting it in front of people for the first time and seeing what they think. You also recorded a version of Donny Hathaway’s “This Christmas” for the upcoming Starbucks holiday compilation Sleigh Ride. CBR: I thought, right, I’ve got some sleigh bells for doing that song! I once sang it on the radio in England, and I looked out and the audience was completely blank. Really? It’s such a great, festive song. CBR: In England it’s like nobody knows that song. He’s such a great writer, Donny Hathaway. I love his arranging. It just puts you in the mood for the holidays, that song. I don’t know what the other people [featured on Sleigh Bells] are doing, but that was the first song that popped to mind because a few of us in the band had done a little Christmas gig the year before in this bar that I used to work in. We played some old Curtis Mayfield songs and we played a Beatles song, but we did a few Chistmas ones, including this Donny Hathaway one. So we already had our own version. What can we expect from your upcoming release The Love EP? CBR: We do this version of Doris Day and Sly & The Family Stone’s “Que Sera Sera”—we play that at the end of every show, and people have been saying, oh, you should record that. So we did. And I wanted to pay homage to some of the musicians that have been a big influence on me. So there’s a Paul McCartney song that I heard when I went to the White House to do that event for him. I heard this string quartet playing a song which I’d never heard before called “My Love.” Then I think Dave Grohl was playing a bit of it the next day in the concert. We went to this dinner and Stevie Wonder was there and we saw this really beautiful friendship between Stevie Wonder and Paul McCartney. I couldn’t get “My Love” out of my head, and I thought, wouldn’t it be great to do a version of the song that’s also got this Stevie Wonder influence, as well? So we’ve got this version on there and it’s got these really nice harmonies that I think are really Stevie-influenced. “Is This Love,” “My Love” and “Que Sera Sera”—we’re definitely seeing why this is called The Love EP. What else will be on there? CBR: We’ve got this version of Prince’s song “I Wanna Be Your Lover.” It’s just really fun! I thought, I never get to do really fun, synthy, aggressive bright things. I also really wanted to do an indie track, so I recorded that song by Belly which is called “Low Red Moon.” We loved it a lot in my band, and we worked out a version of that which I really like. It’s a good mixture. Today is the last day to enter to win two tickets to Corinne’s October 28th show at Avalon in Hollywood (enter here). The Love EP will be released in January.